Make your visiting teaching this month a BLAST with our dynamite message! A festive Americana cardstock is rolled with the message tucked inside, as well as some (super soft & yummy) flag tootsie rolls. 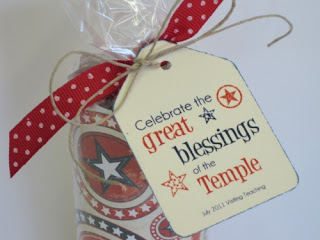 We've finished it off wrapped in clear cellophane, added some polka dot ribbon, and tied on a tag that reads, "Celebrate the Great Blessings of the Temple." And while we're at it... check out our July Home Teaching Gift as well... A frame-able subway art with words and powerful phrases from President Uchdorf's message, as well as the message itself, and enough licorice for the whole family! 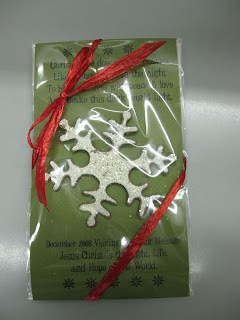 Complete the gift yourself with a personal message on the tag provided. We are sure it will be a hit! Buy these gifts online or in our store in Lehi. The February V.T. Messages are done and here they are! They are so flippin cute! You can call the store and have these shipped if you aren't from the area. Otherwise, they will be available for sale on Monday the 2nd. The message is rolled up inside with a scoopful of cinnamon red hots. 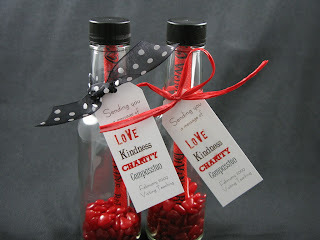 There are no stickers on the bottle so it can be reused for another fun project or display! Yey! These will give you a reason to do your visiting teaching early this month! This is a picture of our December Visiting Teaching Handout. 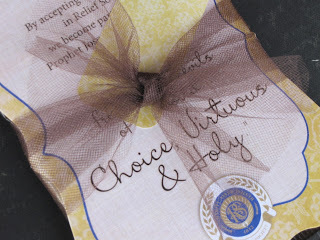 It includes a darling snowflake magnet, a York Peppermint Patty, an excerpt of the message from the Ensign - all packaged together to make such a cute gift for your visiting teaching sisters. This month's price is $3.25. If you haven't ever given something like this before - you should try it! 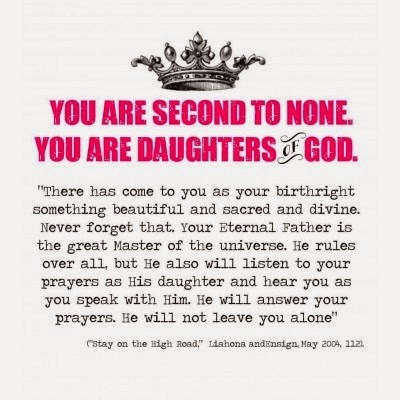 These are so nice to either just drop off when you have sisters that are hard to catch, or also for inactive sisters. It gives them something to open where they can read a spiritual message at their leisure. We have these each month and they are always darling! They usually are priced at $2.25...December's has a little extra in it so they are more. Hope you like them!